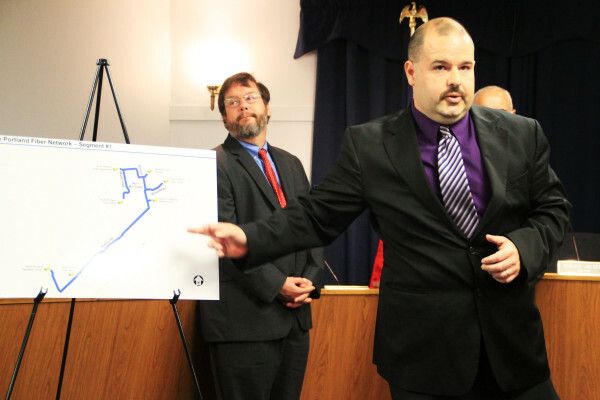 Chris Dumais, South Portland's information technology director, describes the path a new fiber-optic broadband Internet network will take through the city's downtown on Sept. 22, 2014. SOUTH PORTLAND, Maine — The city is rolling out fiber-optic Internet service that will allow some businesses and residents to share data at “gigabit-per-second” speed. The first phase of the project was completed earlier this week at a cost of $155,000, funded through this year’s capital improvement program budget. The three-part project in partnership with Biddeford-based Internet service provider GWI will cost about $260,000. It was approved by the city in September 2014, and will also allow other Internet providers to have access to the fiber. After installation costs are collected, GWI will share 5 percent of the residential and business connection revenue with the city, according to the initial application. The new service is expected to save the city about $2,100 a month in operational costs, Director of Information Technology Chris Dumais said in a news release distributed Tuesday. The high-speed Internet installation will ultimately bring about four miles of optical fiber to a “significant portion” of the city, according to Dumais’ release. Optical fiber is more efficient than metal wiring because it minimizes how much information is lost through longer connections. The fibers are also more impervious to the effects of electromagnetic waves, which would otherwise distort and slow data transmission in metal wires. The first phase of the project serves Mill Creek, Highland Avenue, Ocean Avenue and the Evans Avenue corridor. The second phase, expected to cost about $83,000, will extend to James Baka Drive, Western Avenue, Westbrook Street and Wescott Road. The last phase, for about $25,000, will extend to the new Municipal Services Facility, to be constructed at 929 Highland Ave. Residents interested in connecting can call GWI at 866-490-0100.